By now you probably have noticed that the biggest trend this summer is the rattan handbag. Specifically, it’s been the round-shape silhouette in a cross-body style that has been the hottest craze. BTW – the fashion world uses rattan and straw interchangeably to describe this trend and both are accepted (if you care to understand the difference, please see my footnote* at the end of this post). The rattan handbag has been around forever. Nantucket, an American company had been selling straw baskets since the turn of the century, began producing rattan purses, and these became status symbols for the wealthy yachting set. In the early 1950s, the casual handbag emerged and little baskets of woven rushes were all the rage. By the mid-1950s, sophisticated straw handbags appeared in southern France and colorful straw bags become the rage well into the ’60s. In the 1990’s, which was the decade of the designer handbag, many fashion houses turned to straw. Karl Lagerfield created purses woven from synthetic straw with plexiglass handles. Today, the rattan handbag continues to be popular and once again is being shown in a variety of shapes and styles. If you like fashion and have an Instagram account, there’s no doubt in my mind that you have seen the Cult Gaia “ark” bag (which was last summer’s “it” bag). The “ark” bag has become a staple in every fashionista’s summer wardrobe. 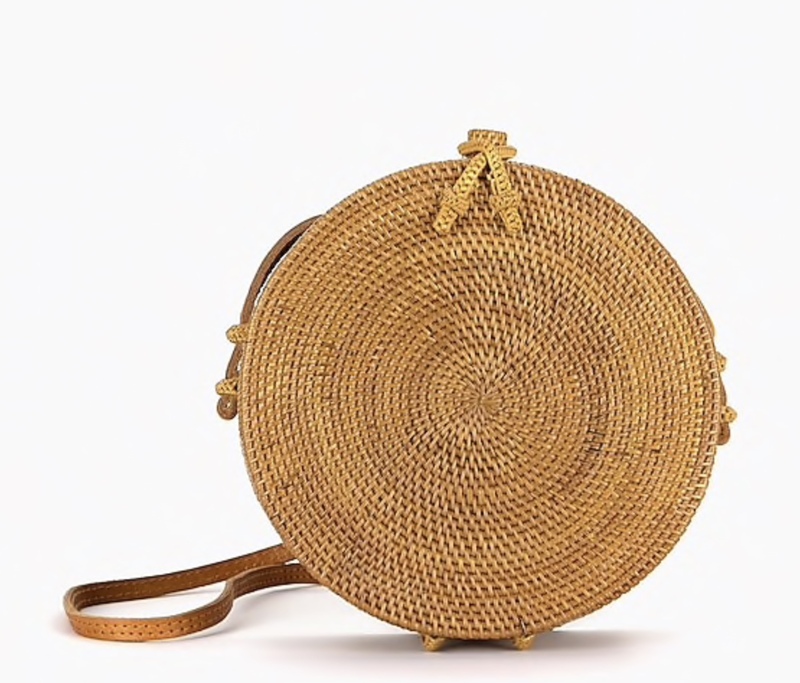 This year, Cult Gaia’s ark bag continues to be extremely popular, however, it now competes with the round-circular rattan bag. This bag with a crossbody strap has been the fashionista’s new favorite this season. My personal favorite has been the Bembien Rose cross bag sold at J.Crew (it’s light, airy and charmingly functional). 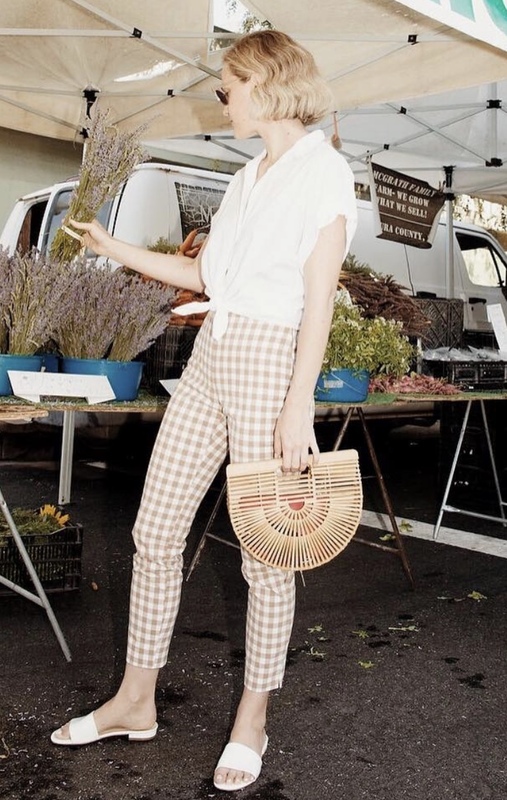 If you have never owned a rattan bag, this is definitely the season to shop for one. The variety is plentiful, fun, chic and available to everyone. They are timeless and no summer wardrobe is complete without one! I have rounded up some of my favorite rattan handbags this season to help you get the one that’s perfect for you. Happy Shopping! Rattan is a specific material and is a close relative of the palm tree. It is a type of vine that rapidly grows in the tropical regions of Africa, Asia, and Australia. Straw is defined as a natural or artificial heavy fiber used for weaving, plaiting, or braiding. Wicker is not a material it is the ancient technique used to manufacture items out of natural materials.